Thanks to Pei Lin who took the effort to organise a blogger's potluck gathering tomorrow. As she will be in town for our National Day holiday, she suggested for a few of us bloggers to meet up. It looks like quite a successful event even though we have not attended it. Judging by the warm responses that she got from us, she must've been encouraged! Some of them were very decisive on what food they want to bring to the gathering. It took me a long long time to decide what I want to prepare for my blogger friends. Most of them can bake really well. 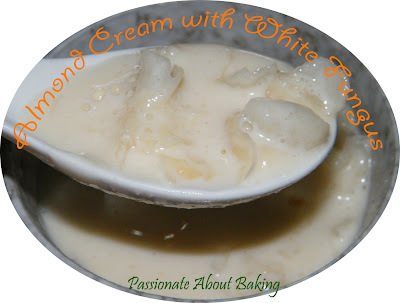 After much consideration, I decided to make Almond Cream with White Fungus for them to try. I learnt this from a workshop previously. This has been one of my favourite dessert since. Shirley has already provided us with the sneak preview of what she will be bringing to the potluck party. I can't wait to try. I'll be one of the lucky blogger to be able to try her wonderful cooking skills. I've also made some nuts to give to my new-found friends, who share the same passion as me. I hope they will like it. Isn't it nice to form a small "community of practice" for bakings? Watch for more posts coming up which will include all the mouth-watering food prepared by the food bloggers. Till then, Ciao! It's great to be able to meet up with fellow bloggers and share all the lovely food prepared. Hope all of you will have a wonderful time! Jane, the almond cream looks fabulous, I am so lucky to able to try it tomorrow! I am the one who cant give the menu cos actually thinking of making mango pamelo dessert but ve to ensure able to get the ingredients 1st. Luck is not with me again, those taiwan mangoes that I got are not ripen enough, a bit sour too argh! !1 now ve to think of back up plan and also hunt ripe mangoes tomorrow morning, if not I will turn up empty handed :( wish me luck which I need badly. hope u girls have a wonderful time.. enjoy. Wish you good luck. Actually it doesn't matter, it's the thought that counts. Any simple bake from you will taste good. :) See you! I can't wait to try your homemade s/w too! I'm a very "bready" person. Heehee...See you! Jane, I am a big fan of almond cream and this is wonderful. Thanks for sharing this dessert with us. I hope you enjoyed yourself today. See ya. Jane, it is reallt great to be finally able to meet up. I have to attest here to everyone that this Almond Cream is really delicious! I am glad that I did not have to just eat with my eyes for this! May I check will you be posting your almond cream with white fungus on your blog? Sorry to disappoint you. I won't be posting up the recipe for Almond Cream as I got this recipe from a workshop. Hope you understand. Noted and understand. I would like to attend the workshop. Could you provide me with any contact for the workshop? I have tried to do almond cream using other recipes on my own but it is either not smooth enough or too watery. You can check out at Chef's Cooking Studio. You can drop them an email to let them know that you are interested in the Almond Cream so that if they have enough people, they might start a class. Hope this helps. I have checked with Chef's Cooking Studio and they are not teaching. I did not give up and went to search on the other cooking studio but none teach this dessert. Would you like to form a class of your own to teach on the Almond Cream with Fungus? Please Advise. I was out of town for a couple of days. I'm sorry, I don't think it's right for me to use the chef's recipe to teach. I can't teach this as I'm no good at it too! Maybe you want to check out a few baking schools and asked if they can teach this? Sorry to disappoint you. I hope you understand. Two birthday cakes for a girl!